I sit and stare at the top of your head, trying to memorize every single white hair, the angle of your ears, the slope of your shoulders. Then it comes to me, “just take a picture, you’ll remember it longer,” and so I do just that. Memorizing every hair on your perfect and beautiful head. I’m dreading putting you to sleep. 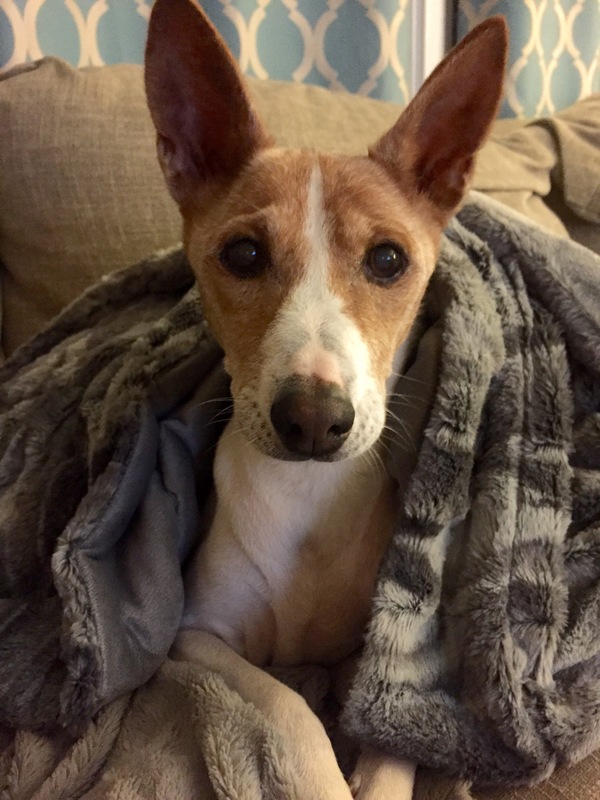 Not because of what’s to come … I know you will be fine, you’ll hop gleefully and joyfully over the rainbow bridge into doggy heaven with your sister Halo, and buddies Penny and Scruffy. I’m dreading it because I remember the last time I did it twenty-two months ago. Red, Halo, Scruffy and Penny BFFS in heaven. You were perfectly fine a month ago. Tip tap, tap dancing your way in circles awaiting your twice daily walks and delicious organic meals. You were hopping up and down off of the couch, off the bed, off the stairs. Gliding through the dog door with ease, and lounging in the sun. And then, in just one day, something changed. Grandpa went to take you for a walk while I was away, and you refused. I came back from my work trip and you were no longer eating. 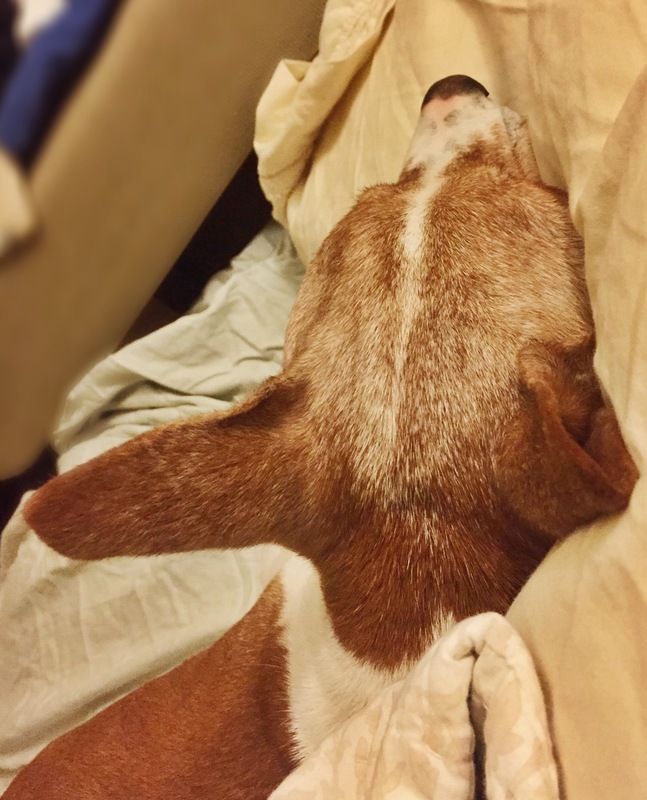 I could hear you panting… you sounded like you had perfected Breath of Fire from yoga class. And your heart, your little heart, was beating right out of your chest, faster than I had ever heard or felt it. I took you into the ER and they told me you had pulmonary hypertension resulting in congestive heart failure and an enlarged heart. Your heart was working so hard to compensate for the lack of oxygen from your lungs, that it enlarged. And because of that you were in shock, and your right ventricle was unable to pump efficiently, so your abdomen was filling up with fluid instead. They gave you medications, had me set up an appointment with a cardiologist. No one told me the outcome originally, but I could see in their eyes. And the internet gave me plenty of information…. you can live off medication a little while longer, but not much. You seemed to perk up by the meds and new food, but then you took a turn for the worse and was re-admitted. This time, the cardiologist told me I might have one day and I should put you down there and then. I wanted you home for euthanasia because you’ve never liked that office, and I didn’t want your last night to be in that hospital. I brought you home, and you could barely lift your head or walk without feeling exhausted. I sit here on my laptop, on our camp-out floor-bed I made with a foam mattress topper and sheets and blankets and pillows, watching you rest quietly, your breathing shallow and rapid, but steady, in and out. As we are settling in for the night, I can’t help but think back to when I was in this space with Halo. You and Halo are/were my Heart and Soul. Halo was my soul, no doubt. She was a soulmate. She tested me, and pushed my buttons, had opinions about everything and was her sassy little self even through her cancer. You, however, are and were always my heart. I met you when you were eight months old. I had taken Halo to Marymoor Dog Park (a dog haven, really) in late 2002. 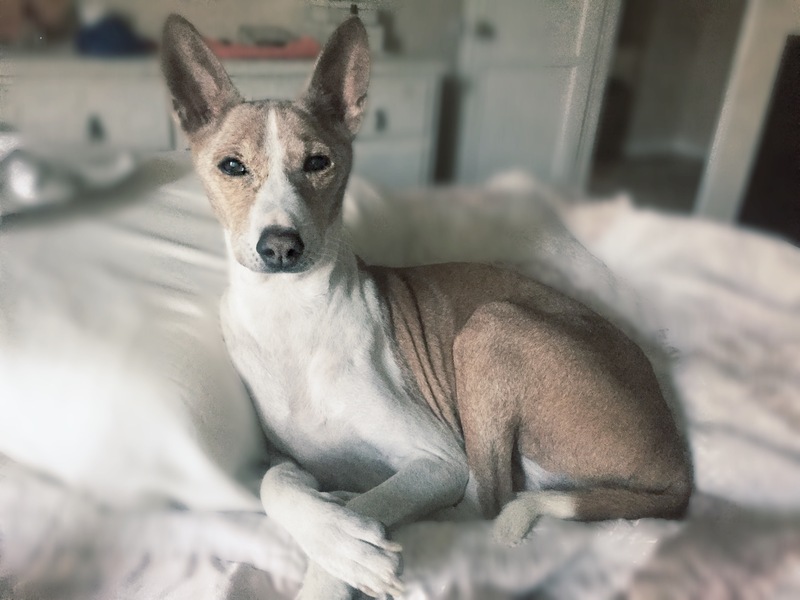 Like the typical basenjis you both are, you immediately found each other and greeted one another. I found out that you were with a married couple, and this was your second home. Your first home was in Memphis, TN and the owners didn’t want you because your legs were too long to be a show dog. 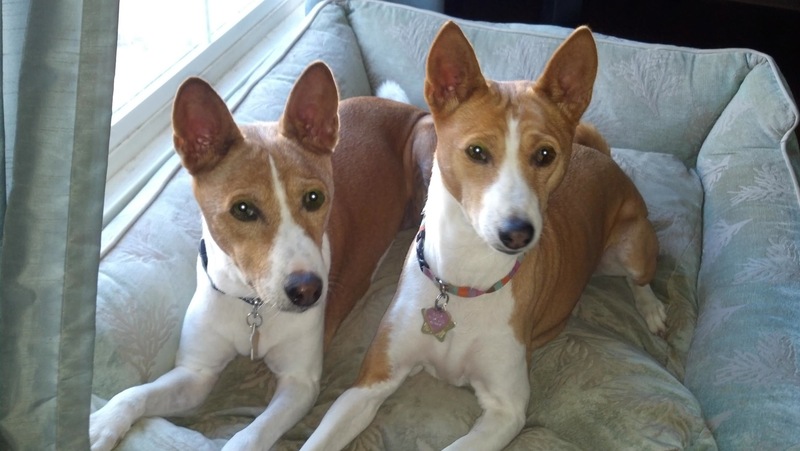 This couple adopted you from Basenji Rescue, had your for about three months and decided they were unable to keep you. 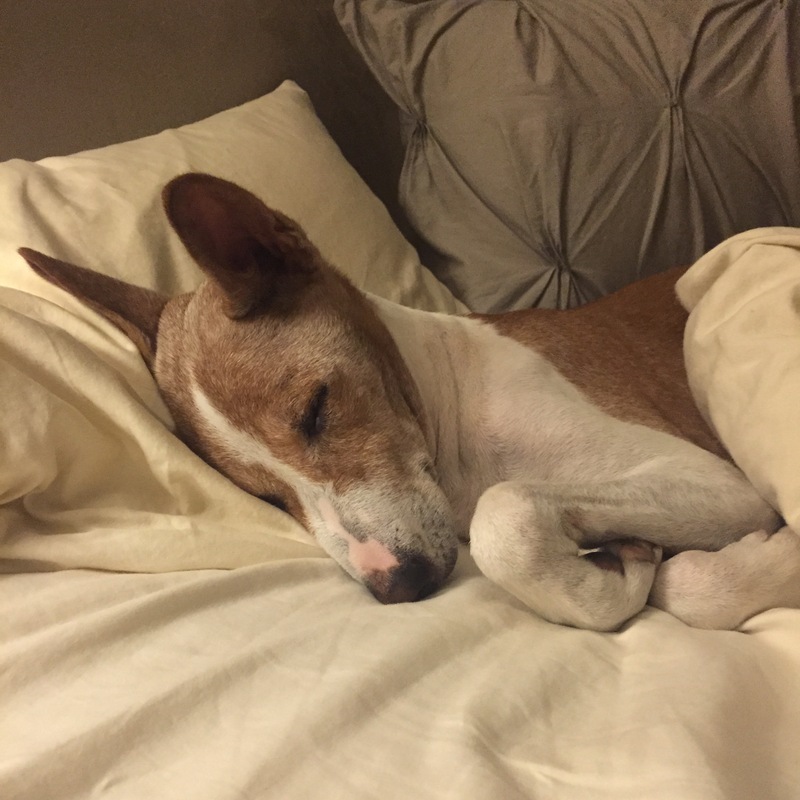 Back onto Basenji Rescue you were listed again. And in fact, I told you on that day that you would never have to have another family again. I would be your forever mom. Now, truthfully (and you knew this at the time) I was looking for a companion for Halo, not a second companion for myself. It was over time that I would realize just how much you would mean to me and how you would not only be my companion, but so much more. I would tell you every day, “I think I might be the luckiest dog mom in the world. I thank you so much for finding me and being my guardian angel. I can’t believe you knew how to find me.” And you would cuddle up on my bed with me, me the big spoon, and you the little spoon, with your head on the pillow every night. You loved sleeping with your head on a pillow hehe. When I put Halo down, you absorbed my pain and sadness. You curled up with me and followed me everywhere so I would never feel alone. You were so involved with my every step I can’t count how many times I’ve accidentally stepped on your toes or closed the refrigerator or the back door on you (by accident). You were always my protector (literally, you bit a few people including my ex-boyfriend), my guardian, and my best friend. You were my best friend xo. They say that your pet mirrors you. Their anxiety is your anxiety, their anger is your anger, etc., etc. Well, that was a big wake up call for me. You have been there for me for every one of my multiple heartbreaks. And here you are, with a literal broken heart. I know that I didn’t directly cause your ailment, but I realize just how much you took on during my many nights of sobbing and heartbreak in the last fourteen years. You were my comforter, I just didn’t understand you were also my emotional sponge. I also want to thank you so very much for the gift you have given me of your unconditional love. There was a time I was reading self-help books and going to a life coach and trying to unblock what was in my heart- why I was attracting the wrong love into my life? One of the books said to meditate on the feeling of love, so that you could attract that same feeling into your life. The book recommended that if there was uncertainty as to what that love felt like, think of a pet you love. And I thought of you. And the many more times I meditated, and continued to meditate daily, I’d have you right next to me so I could feel your real, unfiltered, pure, and unending love. And now I sit here, trying to just absorb the moment, a moment that I know is temporary and fleeting. I dread that the two minutes of time between the sedative and the euthanasia solution will last a lifetime and will be too short all at once. Those two precious minutes where you are at peace before I feel and hear your last heaving breath are the most torturous of all. Your greatest and most precious gift- your heart- is what is failing you now, after all these years of caring and loving me… I know this a matter of shedding your physical body and nothing more, but this house will be empty without you. My heart will be empty without you. I have had a dog in my life since I was 24 years old. I’m now about to be 39. You and/or your sister were with me through all of my twenties and thirties. I thank you for that. I thank you for your love. I thank you for the most amazing and wild ride with you and Halo. And I thank you for your beautiful heart. My only hope is that you will come back to me one day so I can see your pure heart and shining eyes once again. I wrote this post on April 4, 2016. Red passed away naturally sixteen hours later on April 5, 2016. In true and loving Red form, he didn’t make me wait those dreadful two minutes of euthanasia purgatory. He left on his own, and with me right next to him at home. 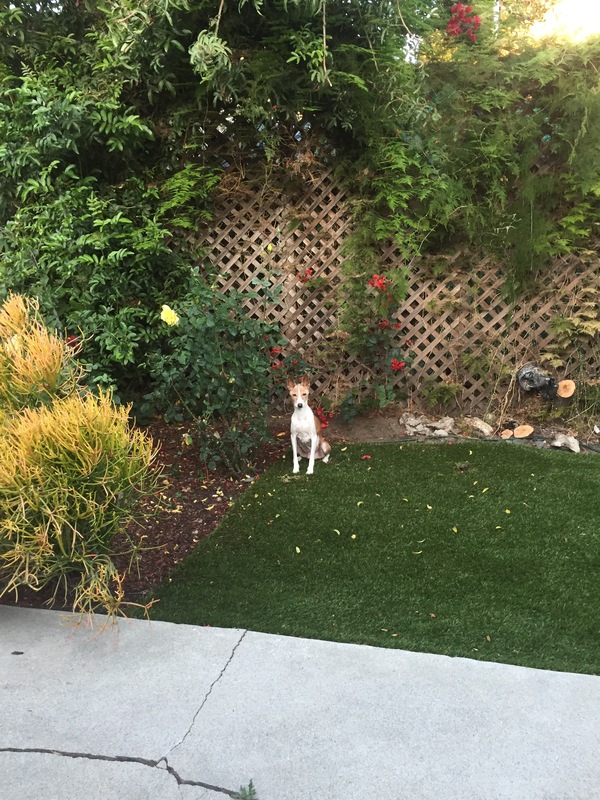 Red, my little buddy, I hope you are tap tapping away with your sister Halo, and I love and miss you already. Your final morning. Still my handsome little fella. I’m so sorry for your loss, Jessica. You’ve got such a beautiful heart. You write beautifully and express yourself very well. I know a good animal spirit communicator if you’d like to explore that avenue. It may bring you comfort. Lots of love to you. You really are an exceptionally gifted, kind and special woman with a heart of gold. That was beautiful. My heart goes out to you.